Projections of housing, employment and population growth are based upon a comparison of existing residential and nonresidential development relative to the future land use expectations and established densities of the Land Use Plan. Inventories and estimates of existing land uses and densities are used as base values for projecting development to a ‘build-out’ condition. 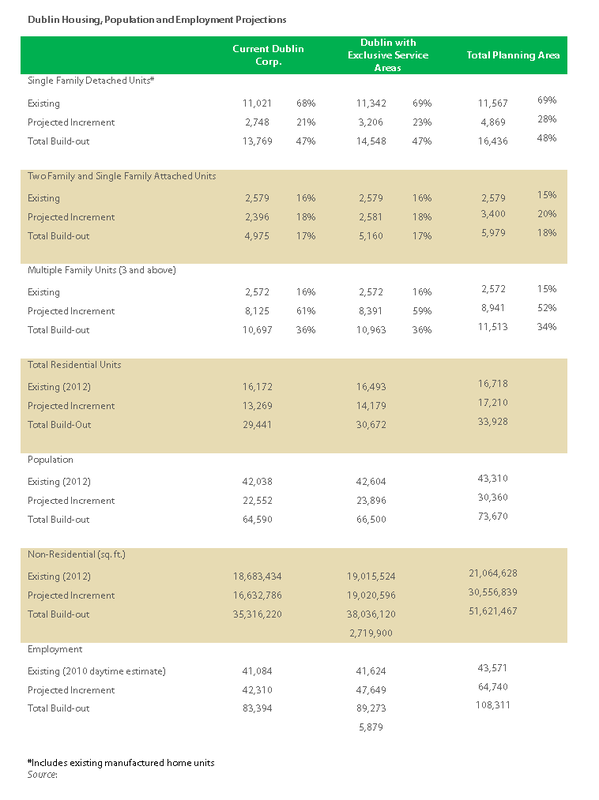 Information used to analyze population include the 2010 U.S. Census, MORPC population estimates, City of Dublin building permit information and data from the Auditors of Franklin, Delaware, and Union Counties. Build-out projections are conducted by assuming residential and non-residential densities for each land use classification shown on the Future Land Use Map and as indicated in the associated land use definitions. Average household sizes for owner-occupied and rental units are projected to decrease slightly in the future; projections of average household size by housing unit type for the year 2030 were used for this analysis equating to 3.16 persons per single-family detached unit, 1.59 persons per single-family attached unit and 1.68 persons per multiple family unit. Average growth rates for the residential population are expected to decrease annually as the city approaches build-out. Employment estimates include assumptions of typical ratios of commercial space to employees for retail, office and industrial uses, which equal 380, 330 and 780 square feet per employee , respectively. These typical assumptions are also adjusted where appropriate, to incorporate more detailed information about planned development characteristics in specific portions of the planning area. Given available base information and applicable assumptions, at full development the entire planning area is projected to include a total population of approximately 74,000 with nearly 34,000 residential units. This includes all of Dublin’s exclusive and negotiated service areas, much of which may not annex into the city. The build-out population within Dublin’s existing corporate limits is projected to reach approximately 65,000. Based upon expected land uses, the city will also have at least 83,000 jobs, doubling current daytime employment levels. At a minimum, if Dublin expands to encompass the city’s exclusive service area, an additional 725 housing units, 1,350 residents and nearly 6,000 jobs are estimated to be generated (excluding existing development expected to remain). These projected levels of development are shown in the table below for three areas: (1) the current Dublin corporate limits, (2) Dublin plus its exclusive service area and (3) the negotiated service areas.